CM: Panagiotis Linardakis created his Portrait out of a photograph in a magazine. The anonymous model he chose seems to represent the true picture of the new generation of people, appearing as much unrealistic as impressive. Avoiding to determine particularities of gender, age and class Linardakis propose a head that is unforgettable to anyone who encounters it. 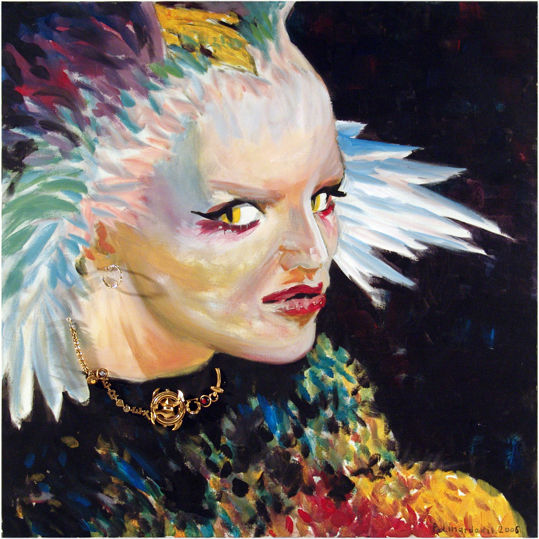 Through the darkness appears the head with strong make-up on the face and decorated with a feathered wreath, which is more colorful than the blouse it wears. The eyes do not simply look at the viewers, but enquire them, returning their gaze of indiscretion. The portrait is completed by real pieces of jewelry - an earring and a necklace - which Linardakis procured from fashionable clothes.